An elevation in symptoms of depression has previously been associated with greater accuracy of reported dietary intake, however this association has not been investigated among individuals with a diagnosis of major depressive disorder. 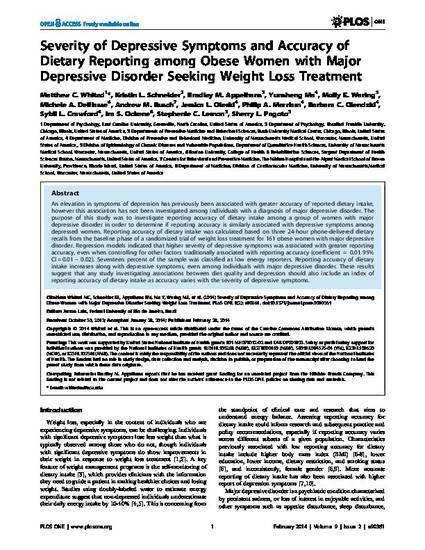 The purpose of this study was to investigate reporting accuracy of dietary intake among a group of women with major depressive disorder in order to determine if reporting accuracy is similarly associated with depressive symptoms among depressed women. Reporting accuracy of dietary intake was calculated based on three 24-hour phone-delivered dietary recalls from the baseline phase of a randomized trial of weight loss treatment for 161 obese women with major depressive disorder. Regression models indicated that higher severity of depressive symptoms was associated with greater reporting accuracy, even when controlling for other factors traditionally associated with reporting accuracy (coefficient = 0.01 95% CI = 0.01 - 0.02). Seventeen percent of the sample was classified as low energy reporters. Reporting accuracy of dietary intake increases along with depressive symptoms, even among individuals with major depressive disorder. These results suggest that any study investigating associations between diet quality and depression should also include an index of reporting accuracy of dietary intake as accuracy varies with the severity of depressive symptoms. Copyright 2014 Whited et al. This is an open-access article distributed under the terms of the Creative Commons Attribution License, which permits unrestricted use, distribution, and reproduction in any medium, provided the original author and source are credited.